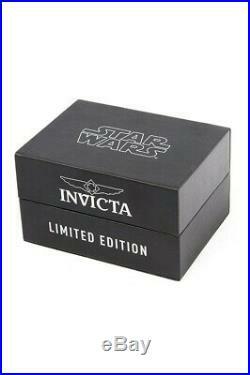 Invicta 27113 Star Wars Men's 51.5mm Chronograph Green-Tone Steel Green Dial. Under federal law We cannot under-declare or mark any items as gifts. We recommend sending your return via a traceable service. At watchgooroo we are committed to providing our customers with the best possible on-line shopping experience. This includes a commitment to excellent customer service, even after your order has been delivered. Watchgooroo is a family owned business with over 15 years of experience in the Watch industry. We specialize in fashion/designer and luxury high end watches. All our watches are guaranteed to be 100% authentic and brand new, come in their original box with all booklets and papers. You may also be interested in.. 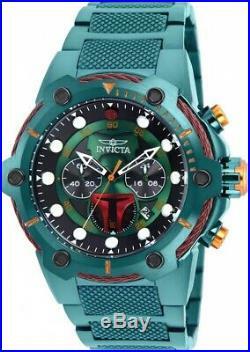 The item "Invicta 27113 Star Wars Men's 51.5mm Chronograph Green-Tone Steel Green Dial" is in sale since Monday, March 4, 2019. This item is in the category "Jewelry & Watches\Watches, Parts & Accessories\Wristwatches". The seller is "watchgooroo" and is located in USA. This item can be shipped to United States, Canada, United Kingdom, China, Mexico, Germany, Japan, Brazil, France, Australia, Denmark, Romania, Slovakia, Bulgaria, Czech republic, Finland, Hungary, Latvia, Lithuania, Malta, Estonia, Greece, Portugal, Cyprus, Slovenia, Sweden, South Korea, Indonesia, Taiwan, South africa, Thailand, Belgium, Hong Kong, Ireland, Netherlands, Poland, Spain, Italy, Austria, Bahamas, Israel, New Zealand, Philippines, Singapore, Norway, Saudi arabia, Ukraine, United arab emirates, Qatar, Kuwait, Bahrain, Croatia, Malaysia, Chile, Colombia, Costa rica, Panama, Trinidad and tobago, Guatemala, El salvador, Honduras, Jamaica, Antigua and barbuda, Aruba, Belize, Dominica, Grenada, Saint kitts and nevis, Saint lucia, Montserrat, Turks and caicos islands, Barbados, Bangladesh, Bermuda, Brunei darussalam, Bolivia, Ecuador, Egypt, French guiana, Guernsey, Gibraltar, Guadeloupe, Iceland, Jersey, Jordan, Cambodia, Cayman islands, Liechtenstein, Sri lanka, Luxembourg, Monaco, Macao, Martinique, Maldives, Nicaragua, Oman, Peru, Pakistan, Paraguay, Reunion, Viet nam, Uruguay.